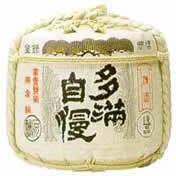 Our quality "Tamajiman" sake was named after the Tama area (the western part of Tokyo, where the Musashino plateau meets the Tama hills). We hope this sake will become a triumph of Tama and bring satisfaction to the hearts of many people not just those in the Tama area. * Barrels come in different sizes, and special ones made for happy events are also available. * Please inquire for prices. ※ The prices of the products above are Ishikawa Brewery's recommended retail prices.